Thanks to all of you who entered our recent competition to win soem Saw goodies to celebrate Lionsgate's theatrical UK release of Saw IV. 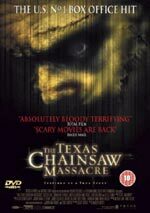 Congratulations Glen - we will be in touch shortly for your postal address to send the Saw goodies to. If you didn't win this time, why not enter our current competition to win a signed poster and a DVD of Captivity, starring Elisha Cuthbert.